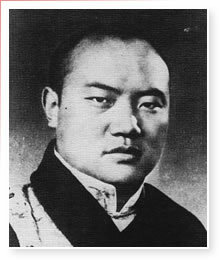 The Dharma Fellowship was originally founded in the Dominion of Canada on 8th June 1973 by personal request of His Holiness the 16th Karmapa, Rangjung Rigpe Dorje (1923-1981), supreme head of the Kagyu Order of Tibet. It began as a small society of Westerners interested in practicing Buddhism and studying the profound secret oral tradition of the Kagyu and Nyingma schools of Tibetan Buddhism. The late Venerable Tenzin Dorje Namgyal was most instrumental, both as a major inspiration and as a source of wise advice, in the development of the Dharma Fellowship. Beloved Namgyal Rinpoche was a longtime personal disciple of His Holiness the 16th Karmapa. As His Holiness the Karmapa stated (April 25th 1977): "I consider Namgyal Rinpoche chief in Canada in the activities of introducing, elucidating and demonstrating the Karma Kagyu teachings." It is entirely thanks to Namgyal Rinpoche that our society embraces the principles we hold most dear. The Dharma Fellowship was newly confirmed in its role by His Holiness the 17th Karmapa, Urgyen Thinley Dorje, at Gyuto Tantric University in Sidbhari, India, on the 18th of April 2000, and entirely reorganized with new headquarters in California, and now with a small monastic retreat center once again in Canada. To study, teach and practice the Buddha Dharma in general. More specifically, to develop and share the Tibetan spiritual tradition of Buddhism in such a way as to be meaningful to Western peoples. To support the ecumenical dissemination of the teachings and practices of the Kagyu Tradition of Buddhism amongst whomsoever might wish to benefit there from. At the heart of everything, is our aim to establish and perpetuate a viable living "Practice Tradition" (Tib: sgrub-brgyud) in the West. What we practice is mystical Buddhist Yoga—the esoteric practice and meditation techniques of the Vidyadharas and Siddhas, passed down from ancient times. The fellowship is a school of Esoteric Buddhism for seekers of truth in the West. His Holiness the 16th Karmapa did not believe that the authentic wisdom-teachings of Tibetan Buddhism would be truly founded in the West until real Western tantric yogis and yoginis could be trained, doing practice in their own native language and culture. To pursue Enlightenment, to directly experience the ultimate nature of Mind through meditation, and to work to make the world a better place—this for us is the very essence of the Buddha Dharma. 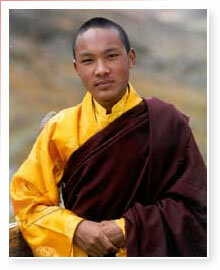 His Holiness the Gyalwa Karmapa is the permanent supreme spiritual head of the Dharma Fellowship. For up-to-date and current information concerning the activities of His Holiness the Karmapa, please visit the Kagyu Office website. Under the direction of His Holiness the Karmapa, head of the Kagyu school of Buddhist practice, we are guided by the spiritual leadership of three exulted Lamas. These are the Venerable Bardok Chusang Rinpoche, the Venerable Karma Gyurme Rinpoche and the Venerable Karma Kunzang Palden Rinpoche. Lama Lodroe Rabsal Rinpoche (Sydney McQueen-Smith), local representative for His Eminence Tai Situ Rinpoche and a leading lineage holder of the late Karma Namgyal Rinpoche, now lives as a resident teacher at our Hermitage on Denman Island. The official Abbot (khenpo) of the Dharma Fellowship is the most Venerable Khenchen Thrangu Rinpoche, personal teacher to His Holiness the Karmapa. As tutor for the four principal Karma Kagyu regents, it was Thrangu Rinpoche who initially established the basic monastic curriculum of the Karma-Kagyu lineage headed at Rumtek, in India. As our abbot, he is in charge of the monastic community belonging to the Dharma Fellowship. 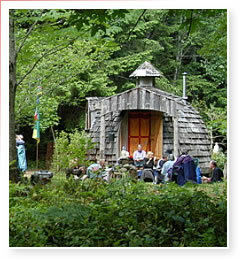 Following the model of yogic ashrams that exist in India, the isolated retreat communities of Tibet, the wilderness hermitages of ancient China, or the forest monasteries of Burma, we feel the need to create a place in the West where deep meditation may be carried out amidst pleasant wooded surroundings and meadows in the beautiful privacy of nature. Our aim therefore is to create a peaceful Hermitage where visitors may come for periods as short as a single weekend, to ten days, three weeks, or as long as three months, to relax and practice quiet meditation under the kindly guidance of one or more authorized teachers. One principle we definitely want to foster, which derives from the ancient ashrams and forest monasteries of the Orient, is that of personal inner seeking, a quest to know oneself, especially through the application of traditional paths of meditation and yoga. In the present age, as a result of new psychological studies and the modern brain imaging techniques of neuroscience, the science of the living brain, there comes solid proof that these ancient paths really do lead to physical, mental and all-round improvement – advanced brain growth, greater empathy toward others, natural stress reduction, fresh states of healthy mental wellbeing, clearer thought, and better functioning. Therefore the difference that can be made in the world through learning the practice of meditation and yoga is enormous! 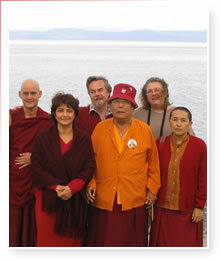 Spiritual Life is meaningless unless there is an aim to make the world a better place for all sentient beings. This great truth obliges us to practice mercy and compassion in our daily lives. Thus motivated by a wish to lesson the suffering of others, the Dharma Fellowship conducts Charitable Work helping poor orphaned children in far eastern Tibet and Tibetan refugee children in Nepal. We encourage members and non-members alike to become Companions of Mercy and help these destitute children in their struggle to survive. The Dharma Fellowship is strictly a membership driven organization. This means that members mutually decide on the direction of their society, inviting various Lamas and spiritual Teachers (of different religious traditions, as they so wish) to give guidance in meditation and spiritual instruction. The Dharma Fellowship is a legal religious non-profit publicly supported society instituted on democratic lines and governed by a member-elected executive Board of Directors. This board is responsible for implementing the wishes of the membership and putting into effect the general business of the fellowship. The board is elected annually at a membership meeting. The Dharma Fellowship is entirely non-political. The Fellowship does not take sides in political issues. A number of other Lamas are closely associated with the Fellowship, such as Tai Situ Rinpoche's secretary Lama Tenam, who very kindly has served as liaison officer between Fellowship interests and the main Office of the Ka'gyu Administration in India. Graf Peter von Finckenstein represents the society in Europe. Although a Buddhist group, we are ecumenical and non-sectarian in our approach. We seek truth, not only as may be obtained through the teachings transmitted from the Buddhist saints of India, Southeast Asia, or the Lamas of Tibet, but also from all the equally wonderful spiritual elders the world over, regardless of race or religion. It is extremely important to us that the individual officers, lamas, teachers, monks and nuns of the Dharma Fellowship be obliged to adhere to the moral and ethical principles set forth in the teachings of Buddhism. We absolutely do not tolerate unethical or sexually abusive behaviour by anyone appointed to be a spiritual exemplar, a Lama or teacher, in our society. It is vital that the conduct of everyone associated with the Fellowship be at all times such as to live up to the centuries old high ethical standards and virtuous reputation of His Holiness the Gyalwa Karmapa. In line with the way we are structured, we also should say that any fault in our presentation, any errors of statement appearing in our literature or on this website, is due to us alone, the members of the Dharma Fellowship.